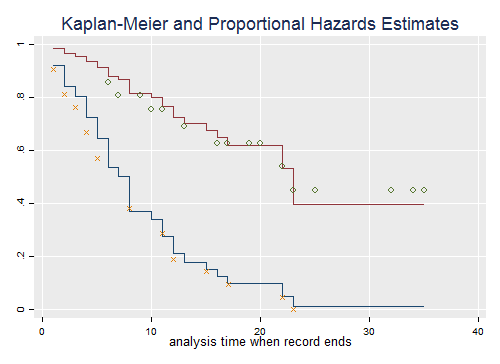 We continue our analysis of the leukemia remission times introduced in the context of the Kaplan-Meier estimator. This is the dataset used as an example in Cox's original paper: Cox, D.R. 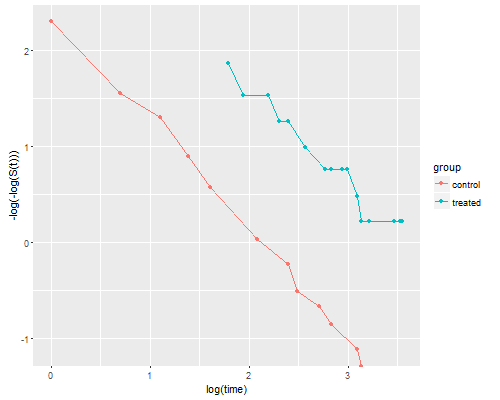 (1972) Regression Models and Life tables, (with discussion) Journal of the Royal Statistical Society, 34: 187--220. We fit a model that assumes a proportional effect of treatment at all durations. 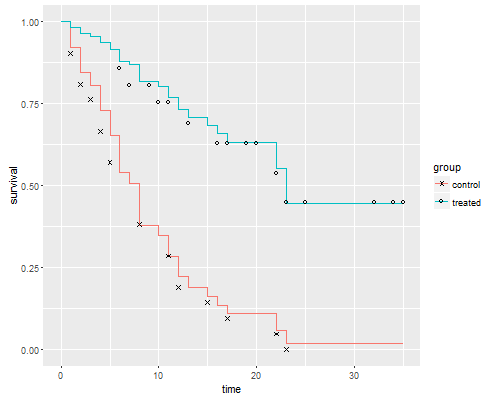 There are different ways of handling ties and we choose the Efron method, which is an option in Stata and the default in R.
. // gen treated = group == "treated"
The results show that at any given duration since remission, the risk of relapse is 7.6 lower in the treated group. 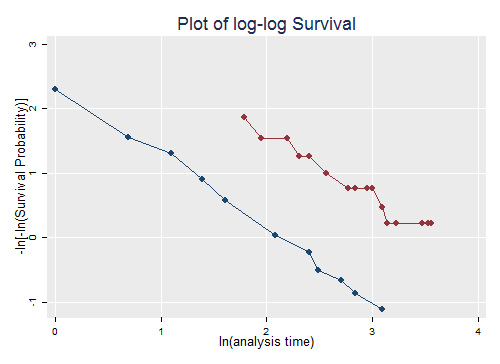 Another way to check proportionality of hazards is to plot the log-log transformation of the survival functions versus log time, that is −log(−log(S(t)) versus log(t), as the lines should then be parallel if the assumption holds. The two lines look quite parallel indeed, showing a good fit of the proportional hazards assumption. A more detailed treatment of these topics may be found in my survival analysis course. The discussion here is an excerpt from the pages dealing with Kaplan-Meier and Cox regression.